All of our lives, we’re pushed to place ourselves in a character type, a box of sorts to describe who we are. We take tests and quizzes to figure out if we’re introverts or extroverts, left-brained or right-brained, skilled or adaptable, safe or risky … the list goes on. The problem is, rarely are we one or the other — we’re usually a little of both, or many. For instance, I can be spontaneous and adventurous at times, like when I decided on a whim to go skydiving my freshman year of college with two friends, when I moved to DC with no job and only knew one person here, when I abandon my homebody plans and stay out late on a Monday. But I can also be very routine and safe, cautious about spending money, needing plans in advance, etc. I can be a social butterfly and meet up with five different people in a week, and spout my everyday doings on Facebook and Twitter, but I can also crave alone time and turn my phone on silent or screen my calls and turn down offers to hang out. I can want to be alone, but feel deeply, devastatingly lonely. I can want to be madly in love, with someone madly in love with me, who wants to spend every minute and every memory with me, but I can also pull back if someone gets too persistent too fast, and I feel smothered and annoyed. What’s that middle ground, that thin slice of balance? How do I get there? A friend and I had a discussion about our romantic pasts and our dreams for the future. We’re both feeling the itch — to figure out where do we go next, to find who it will be with. We wondered what the universe was holding back from us and why — and more importantly, how can we stop ourselves from holding us back. Sometimes we don’t even realize it. Sometimes we’re not giving it a chance, because we’re so quick to cut and run before it gets tough. Sometimes we’re giving it too much of a chance, and letting the past and our memories take hold of us so strongly that we’re not able to be receptive of what’s out there for us. So when you’re feeling like you’re all the way on the edge of one circle of your Venn diagram, how do you get back to the middle without flinging yourself all the way to the other circle’s edge? How do you keep moving forward with everyone else instead of feeling like you’re falling back at the slightest hiccup? We don’t have to be one or the other, we can be both. We can be strong but weak. We can be vivacious but calm. We can be social but withdrawn. It’s that 30% or so that’s sometimes the hardest to achieve and maintain, but often, that place of center that we crave and thrive on. 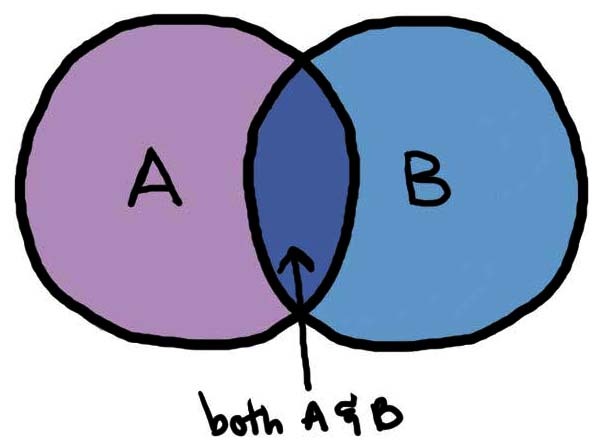 How do you get to the center of your Venn diagram?